More in Heaven and Earth: We need a new Electoral System. And it should be AMS. We need a new Electoral System. And it should be AMS. After the AV referendum in 2011 a consensus formed that Electoral Reform is off the political table for a generation. I completely disagree. The time is ripe for changing our Electoral System. Reform failed in 2011 due to a bad political circumstances, a weak alternative and incompetence campaigning. None of these need re-occur, and the long-term trends will continue to strengthen the argument for change, as they have since the 1960's. The decline of the two party vote, the rise of the minor parties, the increasing inability of 'First Past the Post' (or FPTP) to properly represent the democratic wishes of the people of Britain. None of these things are going away. I want to persuade you that AMS, the Additional Member System, currently used in Scotland and Wales, is the best and most achievable alternative to FPTP (and a superior alternative to AV). The massive 2011 vote against AV doesn't have to kill hope of reform for a generation. But it should kill AV for at least that long. Good, I say. AV was a bad, non-proportional system and we can do better. AV solves only one of the numerous problems with the current system, and in a manner that potentially made other problems worse. It did have one particular advantage that shouldn't be forgotten. It was quite similar to the current system. This made it an achievable reform. Further attempts at change should be focused on a system as similar to the current one as possible, and sufficiently different to AV to give distance from its defeat. Regardless of the problems with FPTP the massive No vote shows there is considerable public sympathy, or at least familiarity, with its principles. Any proposed alternative must work with this familiarity and general public small-c conservatism not against it. It should also not be based on the same principles as AV i.e. preferential voting. This means not only AV, but also the 'Single Tranferable Vote' or STV system is off the table. STV is the system used in Ireland, and the long-term obsession of Electoral Reform campaigners in Britain. It is AV in multi-member constituencies, which unlike AV gives largely proportional results, and it is the preferred system of most reformers. It should be abandoned anyway. If the AV referendum result was a rejection of anything it was a rejection of preferential voting, the only difference between FPTP and AV. STV requires voters to accept change to preferential voting and much larger, unfamiliar, multi-member constituencies. It is just too large a change to sell at once. Both the reform movement's concentration on STV for decades and its overnight conversion to AV in 2011 can be explained by its obsession with preferential voting. Most reformers are just convinced it is cleverer than simple majority voting (putting a cross in a box). However, it has been rejected in the form of AV for now. It would appear to be a change and complication too far and, frankly, it is not worth sacrificing the chance to achieve real change out of a quixotic attachment to the wonders of preferential voting. Another option that needs mentioning is basic PR. This would be a very simple system where you just vote for a party, and then the votes are counted and seats portioned out to the parties equal to its percentage of the vote. This is the only true PR system. However its side effects are so awful that it is generally rejected even by hard-core PR enthusiasts. The problem is that voters have no control over who is actually elected, and there is no geographical connection between voters and representatives or sense that representatives represent everyone, rather than merely those who voted for them. It is hence a massive leap from the current system, though it does bear the award of being the joint simplest system with FPTP from the opposite side of the spectrum. So, ignoring Basic PR, AV, STV and FPTP, what is possibly left? The answer to is very simple. The answer is AMS, the Additional Member System. It's more proportional than FPTP, maintains constituency links, is a modest change, is already used in Wales and Scotland, and in countries like Germany, makes every vote count, doesn't require preferential voting. It would ensure small party representation but still make majorities possible if one party wins an emphatic victory. It works as follows: Most MP's are elected the same way as now, one per constituency under FPTP, with every bit of the country having a constituency MP. In addition to these constituency MP's there would also be top-up List MP's. Parties gain a number of these MP's in proportion to their share of the list vote, taking into account those MP's already elected in the constituencies. The system works like our current FPTP system, but the top-up list MP's dampen the extremity of the results guaranteeing some proportionality and ensuring that if you get enough votes you will get seats. Basically it would be the same system currently used for Scottish and Welsh devolved elections. This system has a number of immediately apparent advantages. Firstly, to go back to the point I mentioned above, it is familiar. It's already used in Scottish and Welsh elections, and it's two parts are also already used separately for current Westminster and Euro elections. It is a system used by Germany and a number of other European countries. As a change from FPTP it would be modest and achievable. Indeed it would be down-right familiar in considerable parts of the country. Everyone would still have an MP elected in the normal way, albeit in slightly larger constituencies. But they would just also have further MP's elected to represent their area. I would recommend a split of perhaps 500 constituency MPs and 150 list MPs. This would keep constituencies a reasonable size, while giving enough list MPs to produce reasonably proportional results. The country would be divided into about 30 multi-member regions (of about 4 MPs each) from which the list-MPs would be elected, attaching even list MPs to a reasonably sized area with particular concerns and demographics. AMS has many advantages over FPTP and AV. Unlike with AV it would be impossible to argue that AMS was an unpopular, marginal system only used in one major country, as was argued, with some basis, against AV. It would be much harder to argue that AMS was complicated or alien as we already use it. There is even the example of an English speaking Commonwealth Nation, which has already successfully switched from FPTP to AMS: New Zealand. Any argument that the system was complex could be answered by saying that the Scottish, Welsh and New Zealanders have no problem with it. Second, unlike AV, this system is always more proportional than FPTP. There will be no incentive for a No2AV, Yes2PR type vote as there was with AV. Almost all supporters of change should have no problem of principle supporting this change, even if they would prefer an even more proportionate option still. Third, it would make every vote count. Whether your candidate wins or loses at the constituency level you still have an incentive to cast a vote for the regional lists, knowing it will go towards securing representation for the party you choose. Equivalently on the parties' side, it will give political parties an incentive to campaign even in no-hope areas, knowing that they need to maximise their vote to gain vital list seats. This is superior to FPTP and also AV. AV made 'every vote count' by allowing people to put their 2nd, 3rd 4th choice towards influencing a result in a constituency, for a party they didn't want anyway, but at least hated slightly less than some other party. AMS gives every voter a chance to gain seats for a party they actually want to support. This also allows people to cast an effective list vote that will reveal the true relative level of party support and still vote in their constituency election as they need to. Fourth, this solves the problem of safe seats. Unlike the rubbish the Yes2AV campaign was putting out, the problem with Safe Seats was never that they exist. If voters in a seat consistently vote for the same party then good for them, that is their business. The problem with safe seats is that if you're in such a seat and don't support the majority party then you may as well stay at home or vote for any other party, or even the party you hated or whatever. It has no impact on the national result. As far as having any impact goes you are effectively disenfranchised. AMS gets rid of that problem by allowing you to cast a regional list vote that actually goes to securing election for the party you support even if there is no point turning up to your constituency election. Fifth. AMS is more resilient to another of the core arguments against AV. Anti-AV campaigners made a lot of the idea that AV violated 'one person, one vote', by taking account of some people's 2nd and 3rd preferences but not others. This issue does not exist under an AMS system where everyone has two votes, in effect, and everyone's two votes are taken into account the same way. These are all advantages of AMS. However, I think there is a more general advantage that trumps anything offered by pure FPTP or AV. Electoral systems are fundamentally about representation. Turning people's opinions and votes into the suitable representation in parliament and in our government and laws. This is the point where I have a confession to make. I would describe myself as a pro-PR reformer but I do not actually support totally proportional representation. A totally proportional system can have distortions just as great as our pure FPTP system. A pure PR system provides fair representation in numbers in parliament, but it risks giving disproportionate power to tiny minorities who hold the balance of power, which can be as distorting as disproportionate numbers of representatives. I want a system that rewards party co-operation and cohesion, not one that leaves government permanently hostage to un-representative minorities. I want a semi-proportional, slightly majoritarian, consistent system. Why else don't I want pure PR? Well, another reason is, and there's no polite way to phrase this, that marginal ideas should be marginalised. Any political cause, no matter how ridiculous, will find some people to vote for it, and no matter how excellent, find some people to oppose it. In a democracy more popular ideas should be privileged over less popular ones in terms of representation, with popularity acting as the only democratically legitimate proxy for the quality of those ideas. Majoritarianism does this. It also provides an incentive for groups to work and stick together, to attempt to appeal to as large a swathe of society as possible, and stretch over a broad range of ideological ground. It discourages and punishes splits, extremism and focusing on appealing to narrow sectional interest. This is as it should be. One idea held by 40% of the population should have more representation than ten ideas each held by 4% of the population. But there must be some limit to this. A decent number of votes should lead to some representation, even if it is weighted down compared to more popular parties. Exact numerical proportionality is not in of itself the most important thing because representation is not a linear concept. It is far more important that you have some representation and only roughly in terms of scale how much that is. Perhaps unusually for a conservative I am worried neither by hung parliaments nor by coalitions. Under any sane system they are an inevitable and natural feature, which can work in a situation populated by realistic adults, both as voters and politicians. 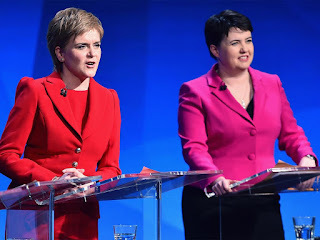 The previous Coalition government and the previous SNP majority in Scotland decisively answer the case against coalitions and minority governments while also conveniently demonstrating that FPTP does not guard against coalitions, nor AMS make single-party government impossible. Absolute majoritarianism for the sake of majoritarianism is just unsustainable. In terms of legitimacy the argument for it is non-existent. Just how small a percentage of the vote are majoritarians prepared to have a single party government elected on? Is 35% not too low already? Would they really rather see a majority government elected with 33% or 30% or 25% of the vote than see a coalition or minority government? My fundamental problem with FPTP is not that it isn't strictly proportional, but rather that it is arbitrary. Its majoritarianism occurs on no consistent basis.It neither weights down less popular parties nor rewards more popular parties consistently. A consistent majoritarianism would always weight down parties compared to more popular ones and weight up parties compared to less, however popular or not they were. This is fair to all parties because they all have the same strong incentive to secure more votes. FPTP doesn't work like that though. It is totally inconsistent. It is a system where the Lib Dems may get 17% of the vote at two elections and receive 9 seats at one election and 48 at another. A party's vote may go down and its seats up, and then next election its vote go up and its seats down. A party may get 31% of the vote and 166 seats, another 27% of the vote and 209 seats, and another 25% of the vote and 23 seats. A party may get 170,000 votes and receive 8 seats and another at the same election get over a million and receive none. And I could go on and on. The traditional rationale for this is that general elections are not one national election, rather they are 650 or whatever individual constituency elections. And our system is a relic of when this was in fact the case. Now it is clearly not though. A general election is largely a mechanism for determining the national composition of parliament. This, in turn, is largely denominated in terms of party lines. Our current system only extremely roughly reflects this reality though. And in the fact it does as well as it does is largely coincidence. At times it has produced more proportional outcomes and at times worse ones. This leads to another fact about representation. The problem with FPTP and also AV is that they are only capable of adequately conferring representation on an individual constituency basis. And on this level arguably AV does a better job. But this is largely irrelevant because both fail on the national stage. I am a liberal conservative who for several years lived in safe Labour seats. But I did not feel entirely unrepresented just because my MP was a Labour party drone for the simple reason that my views were partially represented by Conservative MP's elsewhere, even though I was not in their constituencies. Representation is both national and local. In Britain, perhaps to a peculiar extent, representation really is also local. We value the independence of our MP's and we cling with pride to the notion that MP's may owe their candidacy to a party, but their election is solely in the hands of the particular voters of that constituency. We rightly cherish the closeness of that connection, as well as the magnanimous notion that an MP must represent all his constituents rather than merely those who vote for him. The manner in which MP's are only allowed to be referred to in parliament as 'the honourable member for x' is a mark of this. Their name is unimportant, all that is important is that they have been chosen to represent a particular community. This sense is so deeply ingrained in our political psyche that it would be wrong to derail it. We also correctly take this sense of connection to be stronger the fewer people a representative is responsible for and with closeness of geography and culture. On these clear principles the top-up, multi-member regions would in fact bring representation far closer to most people, by giving relatively local representation to the 60% of voters largely shut-out in any one region because their candidate didn't win a constituency. A mostly unseen problem with the current system is that most of the proportionality it does get comes through overwhelmingly disproportionate results in different regions. Most UK regions are, within themselves, massively dominated by a single party on a minority of the vote. It is only the vast differences between regions that produce even vaguely proportional results nationwide. AMS addresses representation at this level. It's top up seats will elected Conservatives in Scotland, Labour in the South and Lib Dems and UKIP almost everywhere, meaning Conservatives in Scotland will no longer have to look to MP's far to the South, nor Labour voters in the South far to the North, nor the millions of Lib Dem voters to a few distant and scattered islands of representation around the country that few of them actually had a chance to influence, etc. AMS contains both the key intuitions behind proportional representation and majoritarianism. It ensures representation that is both tied to individual voters as closely as possible, and tied to the wider national opinion. In other words a semi-proportional system. Only STV or AMS can deliver this, and AMS is both closer to the traditional British model and less discredited than STV (for the foreseeable future). AMS would improve representation at every level, enfranchise voters across the country who are excluded by FPTP or would be by AV, and update our electoral system for a more pluralist and connected age. It is a modest and simple addition and improvement on FPTP and remains true to its principles that, despite their shortcomings, are built into our understanding of politics and democracy. In many ways it is a thoroughly conservative proposal for reform. And although that may not commend it to some people, I believe that places it in a long, successful and unequalled history of steady, peaceful, evolutionary improvement that has helped make Britain one of the most long-lasting, peaceful, democratic and best governed countries in the world.